Convert-myfiles.link is the PUP that uses misleading techniques to prevent removal. Use Reimage to locate malicious components and get rid of them faster than with uninstall instructions. A full system scan blocks virus reappearance and prevents traffic to malicious domains. Convert-myfiles.link is a browser hijacker created by FirstGate Mobile Limited based in Hong Kong. This application is considered to be a potentially unwanted program as it enters users' machines without their consent and makes unsolicited changes to Google Chrome, Internet Explorer, Mozilla Firefox, Safari or other browsers. Changed browser settings, excessive advertisement, etc. Convert-myfiles.link claims that it provides multiple benefits for users, including free file conversion from/to PDF format, as well as compression, merging, splitting and editing of various files. Apparently, all these functions become available directly from the browser. However, as it is typical to browser hijackers, Convert-myfiles.link is not a useful app and is not free at all. Users have to bear the unending advertisements, questionable redirects, and battle slow browser loading speed. If you want to stop these activities, you have to remove Convert-myfiles.link virus from your computer. Adverts are shown in various forms, such as pop-ups, deals, banners, offers, coupons. Additionally, some words in the text could be turned into hyperlinks, or even personal shortcuts might be affected. The goal of such intrusive advertisement is to gain revenue by exposing users to as much affiliated content as possible. The collection of such data is legal and used by many software authors. However, Convert-myfiles.link also collects personal information you provide. This data might be misused in the future; hence we do not recommend entering your credentials while possessing a browser hijacker on your computer. Possibly the most dangerous feature of this dubious app is its redirecting tendencies. Users might be redirected to legitimate websites, as well as suspicious or even malware-ridden ones. Thus, if users will not be careful enough they might infect their machines with dangerous viruses, such as ransomware. To sum it up, you have to take care of Convert-myfiles.link removal immediately. The easiest way to do so is by installing robust security software, such as Reimage. If you need to use a file converter, find a legitimate program instead of using a browser hijacker that suspiciously entered your machine. 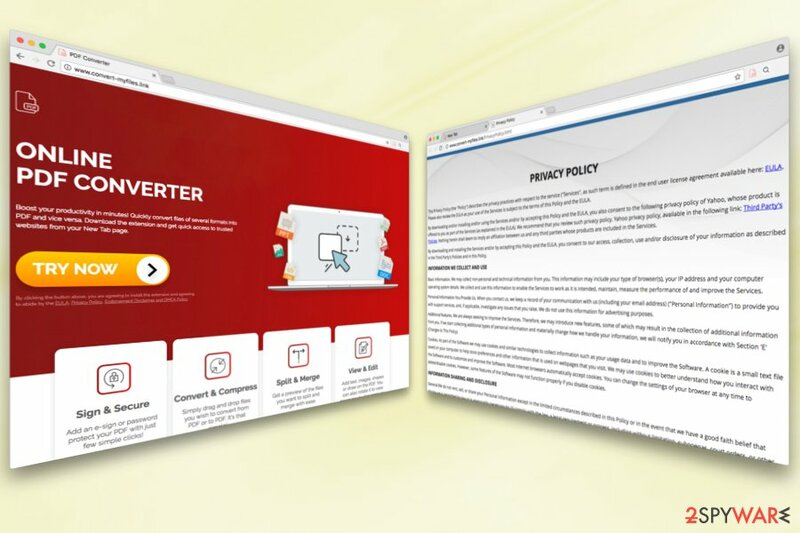 Typically, users are unaware of browser hijacker’s distribution strategies. That is why people usually have no idea how the intruder got into their machine. Hence, it is essential to learn how to install free software from the internet correctly. Finally, to avoid unwanted programs, remove all the tick marks by add-ons, toolbars, browser extensions, optimization tools and other useless applications. Remember that you can only access this function by picking Advanced or Custom installation mode as Recommended settings do not provide such opportunity. There are two different methods you can use to remove Convert-myfiles.link virus from your computer permanently. The first method involves downloading and installing powerful security software. You can pick one of the applications mentioned below, as these programs are designed to deal with not only PUPs but even the most severe malware infections. Thus, by choosing this option, you will be able to protect your computer in the future as well. You can also check our instructions below for Convert-myfiles.link removal. If the guide seems too complicated for you – do not proceed. Nevertheless, if you understand everything clearly, make sure you follow each step attentively so you can avoid unnecessary PC problems. Here, look for Convert-myfiles.link or any other recently installed suspicious programs. Wait until you see Applications folder and look for Convert-myfiles.link or any other suspicious programs on it. Now right click on every of such entries and select Move to Trash. When in the new window, check Delete personal settings and select Reset again to complete Convert-myfiles.link removal. Once these steps are finished, Convert-myfiles.link should be removed from your Microsoft Edge browser. Here, select Convert-myfiles.link and other questionable plugins. Click Remove to delete these entries. Now you will see Reset Firefox to its default state message with Reset Firefox button. Click this button for several times and complete Convert-myfiles.link removal. Here, select Convert-myfiles.link and other malicious plugins and select trash icon to delete these entries. Click Reset to confirm this action and complete Convert-myfiles.link removal. Here, select Extensions and look for Convert-myfiles.link or other suspicious entries. Click on the Uninstall button to get rid each of them. Here, look at the Homepage field. If it was altered by Convert-myfiles.link, remove unwanted link and enter the one that you want to use for your searches. Remember to include the "http://" before typing in the address of the page. Now you will see a detailed dialog window filled with reset options. All of those options are usually checked, but you can specify which of them you want to reset. Click the Reset button to complete Convert-myfiles.link removal process. ^ Browser hijacker. Techopedia. Site explaining IT. ^ Virusai. Virusai. Lithuanian cybersecurity experts. This entry was posted on 2018-04-13 at 02:54 and is filed under Stealing programs, Viruses. You can quickly scan the QR code with your mobile device and have Convert-myfiles.link manual removal instructions right in your pocket. How did you remove Convert-myfiles.link?